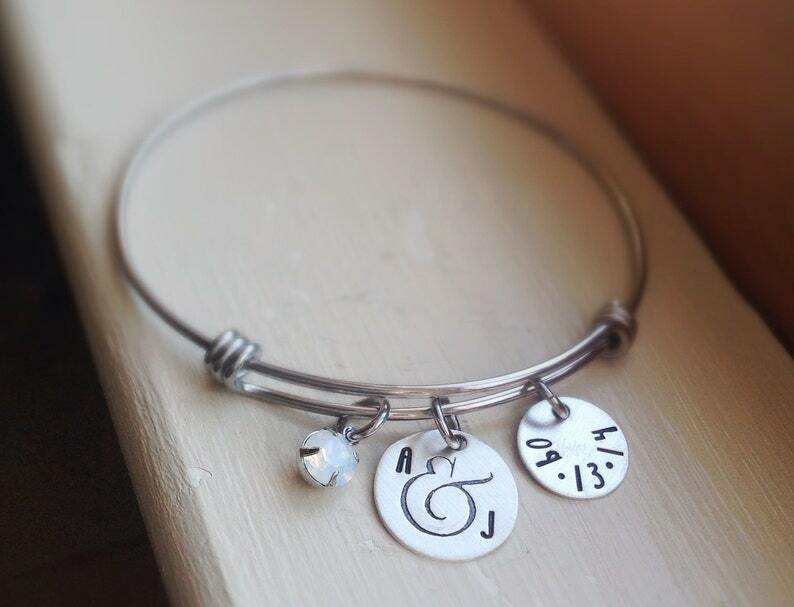 A unique and thoughtful gift for the bride, this trendy sterling silver, stainless steel and Swarovski crystal adjustable charm bangle looks great alone or stacked with several of our other bangle charm bracelet designs. Gently slide open or closed for a perfect, adjustable fit. Stainless steel is hypoallergenic and will not rust or tarnish, making it the perfect gift with heirloom potential. A 5/8" sterling silver disc is hand stamped by me with the initials of your choice, and the 1/2" disc can be personalized with a date. I hand set a pretty 6 mm Swarovski white opal crystal and add it to the piece for a little sparkle. Great gift for bridal shower, wedding, anniversary, or to commemorate any special date. 2) The date (will be stamped in mm.dd.yy format to fit) you'd like stamped on the 1/2" sterling silver disc. Gorgeous and managed to fast track it so that I could get it in time for a special even. Thanks so much! I got this order exactly on time and it was beautiful! It was a perfect memorial to my grandma that recently passed away. Thank you for such a wonderful and special bracelet.